Finally a keeper! Boy painting plein air can be pretty strenuous. The light was failing fast when I did this, but of course that was when everything looked perfect! 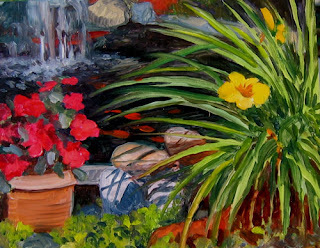 It's the first time I've tried to paint the pond, I think about it all the time, but maybe I've been a bit afraid, especially after my last two failures of attepmted garden paintings. I think this one is worthy of a second sitting. Well I forgot to photograph my fathers card, so'll I'll do the Happy Father's Day post tomorrow! Thanks Jeanne, My garden is having a banner year for color this season!